American Express and the National Trust for Historic Preservation are pleased to announce that 13 Twin Cities area historic sites will receive grants as part of Partners in Preservation’s $1 million commitment to preservation efforts in the area. In addition, American Express and the National Trust for Historic Preservation are giving a $5,000 award to each of the remaining 12 Partners in Preservation sites in recognition of their participation in the initiative and their commitment to preservation efforts. Thank you to everyone who voted in the 2011 Partners in Preservation initiative. The Chateauesque style mansion that houses the American Swedish Institute was built in 1908 as the home of Swedish-American newspaper publisher Swan Turnblad. Turnblad gave the home to the American Swedish Institute which today is the world’s pre-eminent center for Swedish-American culture and history. The American Swedish Institute was awarded $90,000 to restore its historic first floor kitchen, dry storage room and butler’s pantry to their original condition. Originally built as the Banfill Tavern in 1847, the Banfill-Locke Center once served as a farmhouse, an inn, a store and post office, and a tourist retreat. Today the structure houses a major county arts facility providing locals with cultural programming and event spaces. The Banfill-Locke Center for the Arts received a $5,000 award in recognition of its participation in the Partners in Preservation 2011 initiative. Winner of the popular vote! 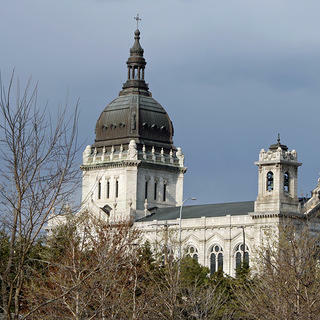 This house of worship designed by French architect Emmanuel Masqueray and completed in 1915 is a Minneapolis icon and was the first Catholic church in the United States designated a Basilica by the Vatican. The Basilica of Saint Mary was awarded $110,000 to repair the Narthex and the Sacristy of the Basilica, including the repair of decorative ceilings, limestone walls and damaged plaster and restoring the historic paint and gold leaf found throughout the structure. Chaska’s Athletic Park was built by volunteers in 1950 and still retains the classic features of a 1950s baseball field. For over fifty years, the Athletic Park has been used for community gatherings. It is also still used a baseball venue for local and regional teams including the Chaska Cubs which were established in 1929. Chaska Athletic Park received a $5,000 award in recognition of its participation in the Partners in Preservation 2011 initiative. Originally constructed in 1911 for a Norwegian Evangelical Lutheran congregation, Christ Lutheran Church on Capitol Hill is today one of Saint Paul’s most culturally-diverse congregations. Today, congregants represent over a dozen nationalities and speak not just English, but Kymer, Lao, and Tigrinya. Christ Lutheran Church on Capitol Hill was awarded $50,000 for brick masonry repair and the repair of the church’s prominent concrete columns that define the main entrance of the church. The oldest Czech Slovak hall in the United States, C.S.P.S. Sokol Hall has been a center for athletic and community programming since it was first constructed in 1887. The hall’s auditorium still hosts organization and family meetings, fitness programming, dinners, festivals, and musical and theatrical events. C.S.P.S. Sokol Hall was awarded $80,000 to install an air conditioning system in the second floor auditorium which will allow the space to be used for public events year-round. The Emerge Center was built in 1893 as Minneapolis’ first branch public library. Local community development organization EMERGE is converting the now-vacant library into a technology center to serve the North Minneapolis neighborhood. The Emerge Career and Technology Center was awarded $110,000 to restore the library’s ornate interior, including surviving 1893 interior woodwork, flooring, and plaster walls, along with its distinctive wood windows. Once called the “White Dove of the Prairie,” the Episcopal Church of the Transfiguration served as the spiritual and community center for some of Belle Plaine’s earliest residents. Today this rare 1869 wood-framed buttressed Gothic Revival church hosts tours and special events. The Episcopal Church of the Transfiguration received a $5,000 award in recognition of its participation in the Partners in Preservation 2011 initiative. The Fitzgerald Theater, designed by architects Marshall & Fox, first opened as the Shubert in 1910. Converted into a movie theater in the 1940s, the building was purchased and rehabbed by Minnesota Public Radio in the 1980s. Today the “Fitz” is Saint Paul’s premier performance space and is home to Garrison Keillor’s popular radio show “A Prairie Home Companion.” The Fitzgerald Theater received a $5,000 award in recognition of its participation in the Partners in Preservation 2011 initiative. Building 67 with its prominent Second Empire style clock tower has been the heart of Fort Snelling’s Upper Post since the building’s construction in 1879. Hennepin County Sentence to Service (STS) crews have played a major role in the ongoing work to prepare Building 67 and other Upper Post structures for future reuse. Fort Snelling Upper Post Building 67 was awarded $40,000 to restore the rare historic Seth Thomas/Hotchkiss model clock in the clock tower. Harriet Tubman Center East was first constructed in 1965 by a disciple of Modern architect Marcel Breuer to house an order of Benedictine nuns. This Modern style monastery has been repurposed by Minneapolis-based Tubman as a family violence shelter and treatment center. The Harriet Tubman Center East was awarded $84,000 to update the Center’s public restroom facilities at the first floor. Built in 1888, the Masonic Temple is one of Minneapolis’ earliest office buildings and today is home to the Hennepin Center of the Arts, now part of the Cowles Center for Dance & the Performing Arts. The Center houses rehearsal and performance spaces and studios for working artists. The Hennepin Center for the Arts received a $5,000 award in recognition of its participation in the Partners in Preservation 2011 initiative. Historic Pilot Knob is a bluff located at the confluence of the Mississippi and Minnesota Rivers and is today a public wildlife park. The site is sacred land to the Mdewakanton Sioux (Dakota) and was the scene of several important events in the history of early Minnesota. Historic Pilot Knob was awarded $75,000 to bury existing power lines that currently disrupt the natural landscape. Home to railroad tycoon and “Empire Builder” James J. Hill, this 1891 Peabody & Stearns mansion today operates as a popular house museum. The James J. Hill House is the only home on historic Summit Avenue regularly open to the public and is a showplace for outstanding decorative arts and social history interpretation. The James J. Hill House received a $5,000 award in recognition of its participation in the Partners in Preservation 2011 initiative. The Landmark Center in downtown Saint Paul was built in 1902 as a federal courthouse, post office, and customs building. After a decades-long restoration of the structure’s ornate interiors, the Landmark Center is today a cultural center and events venue and is home to many tenant nonprofit organizations. The Landmark Center received a $5,000 award in recognition of its participation in the Partners in Preservation 2011 initiative. One of Minneapolis’ newest and most innovative public parks, riverfront Mill Ruins Park is part promenade, part archaeological dig. 1.6 million visitors annually visit to the park to see the ruins of the city’s oldest flour mills, structures that once powered the growth of Minneapolis into the “Flour Capital of the World.” Mill Ruins Park received a $5,000 award in recognition of its participation in the Partners in Preservation 2011 initiative. Overlooking the Mississippi River, Minnehaha Park is one of Minneapolis’ oldest and most beloved public parks. While it is probably best known for its dramatic 53-foot-tall Minnehaha Falls, the park is also home to several historic 1930s structures built by the WPA (Works Progress Administration). Minnehaha Park received a $5,000 award in recognition of its participation in the Partners in Preservation 2011 initiative. The Minnesota State Fair has been held at its present site since 1885 and is home to numerous large-scale historic structures. The heart of the Fairgrounds, the 1909 Grandstand and its large 1937 access ramp, see almost 3 million visitors a year. The Minnesota State Fair Grandstand was awarded $30,000 to help achieve the original architectural vision for the historic ramp with the installation of tower lights and new fencing that is in character with the 1937 structure. When it was completed in 1907, the Jackson Street Roundhouse was a steam engine maintenance facility for James J. Hill’s Great Northern Railway. Today the former Roundhouse is home to the Minnesota Transportation Museum. The museum exhibits a large collection of vintage buses and railcars and gives visitors a chance to see the restoration of these important machines. The Minnesota Transportation Museum received a $5,000 award in recognition of its participation in the Partners in Preservation 2011 initiative. Minnesota’s oldest black religious congregation, Pilgrim Baptist Church was founded by ex-slaves in 1866. This congregation was critical to the formation of local chapters of the NAACP and the Urban League and is still an important community institution. Today, this 1928 church offers a variety of social and spiritual ministries to the Saint Paul community. Pilgrim Baptist Church was awarded $86,000 to repair heavily damaged sections of brick masonry on the exterior of the building. Pioneer and Soldiers Cemetery is the only cemetery that is listed as an individual landmark on the National Register of Historic Places. Originally known as Layman’s Cemetery, this burying ground was established in 1853 and is the final resting place for some of Minnesota’s earliest settlers including soldiers from the War of 1812, the Civil War, and the Spanish-American War. Pioneers and Soldiers Cemetery was awarded $20,000 toward the removal, cleaning, repair and reinstalling of the cemetery’s historic fence. The Soap Factory was first constructed as a factory and warehouse in 1883 and was later home of the National Purity Soap Factory. This former manufacturing building is now the home of one of Minneapolis’ most innovative arts exhibition groups and serves as a laboratory for experiments in contemporary art, hosting a range of arts programming for over 24,000 visitors annually. The Soap Factory was awarded $70,000 toward the repair of the failing roof of the main building. The Washington County Historic Courthouse is the oldest surviving courthouse building in Minnesota. Sited atop one of Stillwater’s highest hills, the domed courthouse was once a symbol of the might of the St. Croix Valley’s lumber industry. The building is today a museum of county history and an events venue. The Washington County Historic Courthouse received a $5,000 award in recognition of its participation in the Partners in Preservation 2011 initiative. The Waterford Iron Bridge, built in 1909, was the earliest engineered bridge in the area and is the only known metal through-truss bridge in Minnesota featuring bolted connections. No longer open to car traffic, the bridge will soon be incorporated into the Mill Towns Trail and will become a pedestrian and bike crossing over the Cannon River. The Waterford Iron Bridge was awarded $95,000 to remove and replace its cracked southeast wing wall. Built in 1906, the Tudor Revival style Wayzata Depot was once a primary stop on James J. Hill’s Great Northern Railway, connecting visitors from around the country to resorts along Lake Minnetonka. Today the depot houses the Wayzata Historical Society and Chamber of Commerce. The Wayzata Depot received a $5,000 award in recognition of its participation in the Partners in Preservation 2011 initiative.